PU Coated Nylon outer with a warm Sherpa fleece lining. 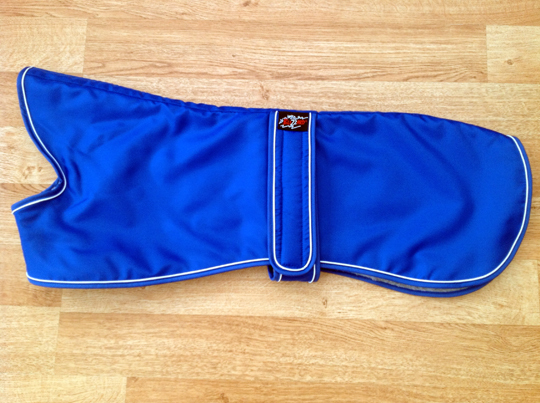 Hooded style, sewn front with an adjustable hook & loop (velcro) girth band. 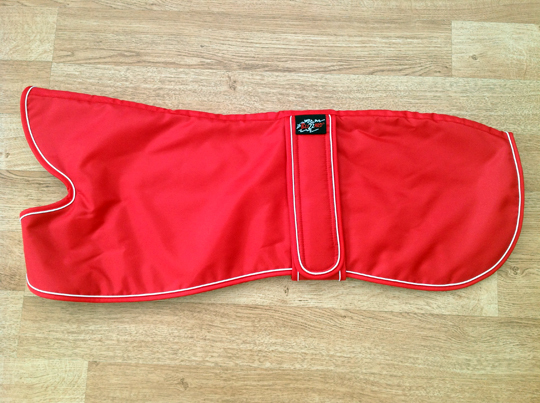 The hooded section of the coat is designed to cover the the neck of your dog (not the head!) in bad weather. If not required it can be turned back to form a folded collar. The coats listed are described as greyhound coats, but would also be suited to most lurchers unless very stocky. 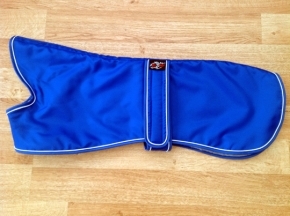 The Blizzard coat sizes are specified in inches. 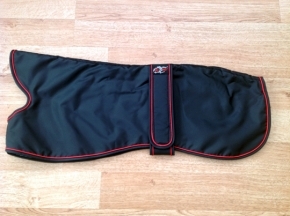 Measurements for your Blizzard coat should be taken whilst your dog is standing. The measurement should be taken from the base of your dogs neck/shoulder blades along the spine to the base of your dogs tail. It is better to have a coat which is slightly too small, a coat which is too big will restrict the tail and tend to slip. Blizzard coats are bigger then the size you order. Please order the spine size as per measurement instructions above (ie. from the base of your dogs neck along the spine to the base of your dogs tail). If you do not want an over hang at the back it may be better to order a size down. Size 22- actual overall length is 28"
Size 24- actual overall length is 31"
Size 26- actual overall length is 34"
Size 28- actual overall length is 36"
Size 30- actual overall length is 38"
This is to allow for the fold back hood and extra for over hang at the back. Please do not take a size from a previously bought coat from another manufacturers as sizing will be different.